(Last Updated : 07.01.19). Download HTET Answer Keys 2019 Level-2 for TGT English, Hindi, Sanskrit, Science, Maths, Home Science etc. Official Answer Key of HTET TGT Exam 06 January 2019 has been released as per the schedule (07.01.2019) after the exam. HTET Level-2 exam was held on 6th January 2019 at various exam centres across the state. HTET 2018 TGT Level-2 exam was held on 06 January 2019 in Morning Session. The candidates who have appeared in HTET 2019 exam for level-2 of TGT can see final and Official HTET Answer keys of TGT Level-2 exam 2019 here. Answer Keys of HTET 2019 Level-2 TGT are available here as official after the exam. Official Answer Key of HTET Level-2 Exam January 2019 are released as per schedule. Official Answer key of HTET 2018-19 for level-II (TGT) exam have been uploaded by HBSE/BSEH on the official website i.e. www.bseh.org.in or www.htetonline.com. Final answer keys will also be uploaded after the answer key objection received from the candidates. See HTET TGT Answer Key 2019 below as the keys are available on the official website. (1) It is a form of active play. (2) It is known as make believe play. (3) It involve overt behaviour. (4) It is always reproductive. Note : The answer keys uploaded here are official and will be updated* at regular intervals. Final answer key of TGT Exam 06.01.2019 can be checked here as the HBSE Answer Keys will be available on the official website as per the schedule. HTET January 2019 Answer Key for Level-2 TGT Exam 06.01.2019 for all subjects can be downloaded at below links. 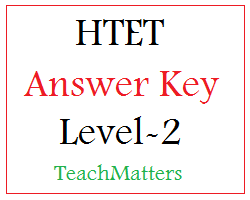 HTET Answer Key published here are official and final. Answer Key Objections : HTET Answer Key Objections for HTET Level-2 TGT Exam January 2019 can be submitted as per the schedule & instructions issued by the board. For more information click the below link. HTET ka Result kb aayega sir, please bta dijiye.